The region’s largest wastewater-treatment plant is back in environmental compliance, King County officials say. 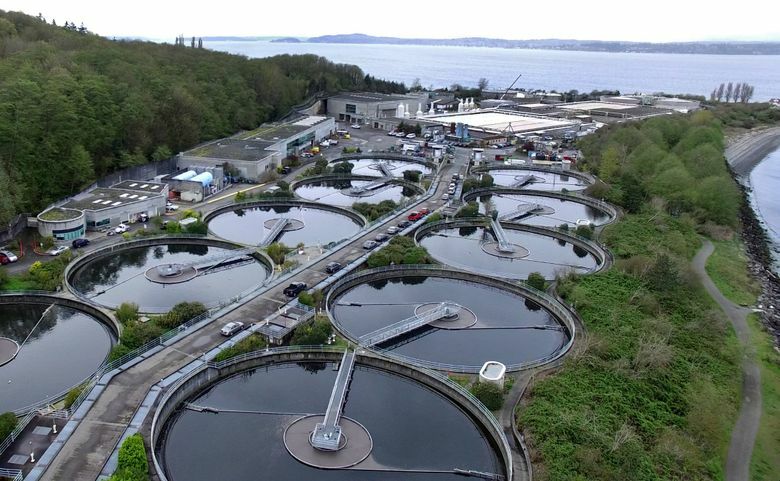 The region’s largest wastewater-treatment plant is back in compliance with its environmental permits, King County officials announced Thursday. “This is a major milestone,” said Christie True, director of King County’s Department of Natural Resources and Parks, which has authority over wastewater treatment for the Seattle metro region. The West Point treatment plant, the region’s largest, was severely damaged during a catastrophic floodFeb. 9 and could not begin performing full wastewater treatment as required by state permit until May 9. Wednesday was the first 24-hour period of sampling of the plant’s effluent discharged to Puget Sound offshore of Discovery Park that showed full compliance with its state and federal environmental permits, True said. Electrical repairs will continue at the plant until about October, True said. An independent investigation into the causes of the flood by the Metropolitan King County Council is underway. Both the state Department of Ecology and the county are undertaking monitoring to better understand environmental effects of the unpre­cedented failure at the plant. Ecology will not be able to verify the plant’s return to compliance until regularly scheduled sampling reports are completed in June, said Mark Henley, water-quality section manager at the northwest regional office of the state Department of Ecology. Boilers, electrical panels, switches, insulation, motors and pumps had to be replaced or repaired after some 15 million gallons of raw wastewater swamped the plant. A Seattle Times special report found that errors of judgment, poor communication, a lack of training, equipment failures and faulty maintenance led to the disastrous flood. 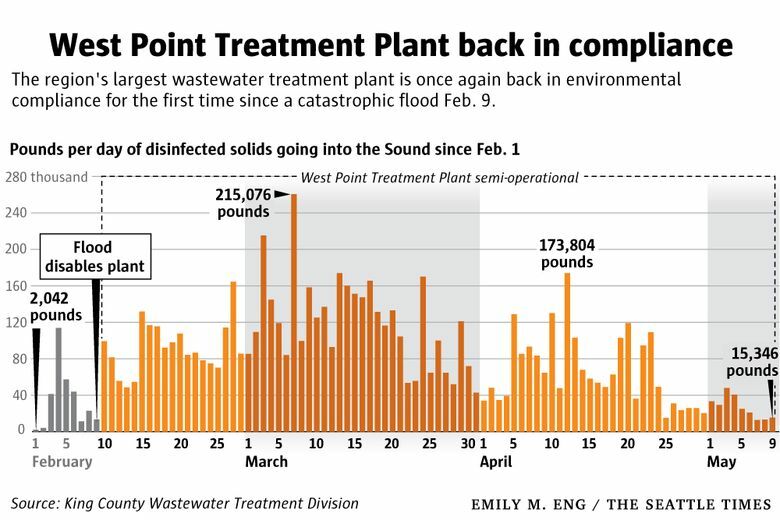 It was one of biggest infrastructure catastrophes in regional history, and sheer luck that no one was seriously injured or killed, wastewater managers say. 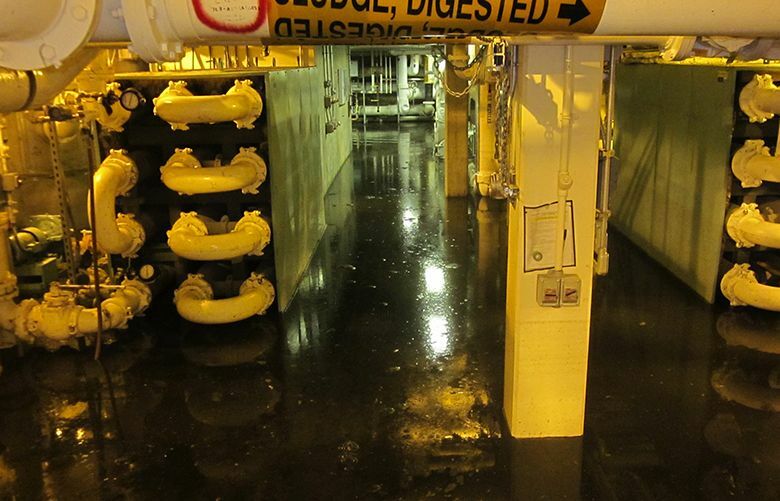 King County has dumped an estimated 235 million gallons of untreated wastewater — including 30 million gallons of raw sewage and hundreds of tons of partially treated solids — into Puget Sound because of the damage to the plant. Ecology is still investigating the incident, and has not yet determined whether or how much to fine the county for the incident, Henley said. “We certainly recognize the significance of what happened and we really want to make sure it doesn’t happen again,” True said. The county’s risk assessors estimated more than $25 million in damage was done to the plant by the flood. The total cost of repairs, and how much the county’s insurer will cover, is not yet known. In addition to the review of what went wrong, the council also has commissioned a review of asset management at the plant, and the plant’s readiness for reliable service over the next 50 years. The plant is the region’s workhorse, handling more wet-weather flows of stormwater and sewage than any other facility on the West Coast.